WASHINGTON, DC -- For now, there’s nothing that can or will be done to stop Russia from playing ugly games with its non-NATO neighbors. 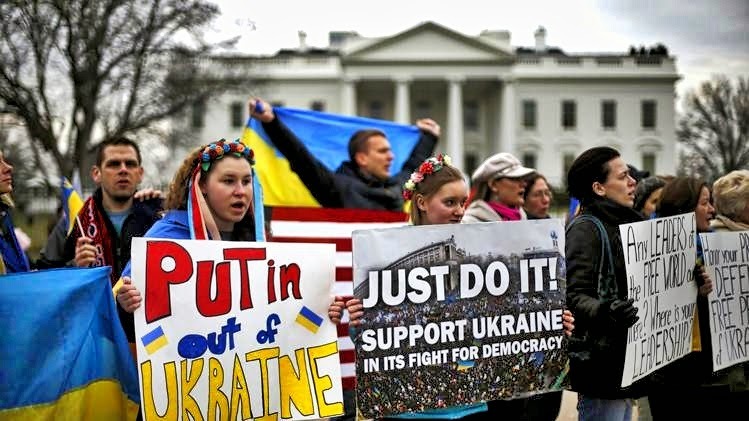 Protesters call for U.S. action against Russian incursions into Ukraine, in front of the White House in Washington. But in the long term, Moscow can be made to regret its folly. The reality that no one in the West can bear to face is that there is nothing that can be done to stop the growing control of Russia and Russian-backed militias in eastern Ukraine. President Obama, Secretary of State Kerry, and a few half-hearted Europeans can threaten and bloviate, but President Putin is obviously untroubled by this noise. All Obama and his minions are doing is underlining who holds the cards, and it isn’t Washington. In the short run, Russia has the power to do as it pleases on its borders. But, and here’s the good news, the United States and the West have the real power over the long run—if only Western nations would unite strategically and take the decisions that could reverse the tide over time. It will not be easy for Putin to absorb the poverty-stricken and indigestible eastern Ukraine, even if Russian-speakers make up a majority of inhabitants. These Russian-speakers likely will discover a future unhappier than their past. These underlying realities were obscured Friday as Ukrainian troops surprisingly asserted themselves against separatists, only to be repulsed by Russian-led militias. Putin underlined the clash by warning that the Kiev-initiated assault would mark the end of diplomatic solutions outlined recently by the major powers in Geneva (as if Geneva had ever been viable). The moment is ripe for the White House to forge a strategy for the long run, one where it possesses the economic and strategic advantages. Obama certainly realizes that no sane person is expecting him to go to war over Ukraine or perform miracles to stop the disgusting Russian takeover. What leaders the world over are praying for is a United States that demonstrates that it can manage very difficult situations competently. They don’t expect instant solutions at all; they do yearn for Washington to outline a workable path they can follow, one that checks Russia’s temptation to muscle its neighbors even to the point of outright aggression. This strategy should have two dimensions. The first is to help the Ukrainians shape up as a condition for Western military and financial aid. The second is to gain support for sanctions by making the stakes for free countries far more graphic and by clearly figuring out how to make the costs of sanctions more bearable. The core of this strategy is to focus on developing long-term strengths and avoiding short-term, ineffective diplomacy. This week, Ukraine’s acting president, Oleksandr V. Turchynov, admitted to reporters that Ukrainian forces are helpless to restore order in the east or to neutralize the well-armed militias. Images tweeted on Thursday of riot police surrendering in Donetsk dramatized his words. Putin punctuated this by calling for the withdrawal of Ukrainian forces from eastern Ukraine. It’s important to notice that these events in the east were not followed by calls from Kiev for American military intervention. Not even Sen. John McCain and his cohorts are demanding American boots on the ground, though they come awfully close to suggesting that Obama is weak for not doing so. Not even the hawkiest neo-conservative is calling for war, a novelty in recent American history. Ukrainian leaders do not expect America to go to war to save their eastern regions; they do expect, and they have the right to expect, that Washington will take steps to protect western Ukraine. The toughest call here is, of course, exactly what help to provide. American assistance should be premised on Kiev being able to establish and sustain a good, corruption-free, and effective government. If those leaders can’t get their act together, even in the face of survival, they will not be worth helping and no help will truly assist them. In this spirit, initial steps by the U.S. and Europe to assist Kiev have to be small and promising. The economic aid pledged thus far by the IMF and others should be doled out in accordance with humanitarian necessities and as directly as possible to the Ukrainian people. If government officials don’t steal it, then it should be increased. Talks need to be held on the military front as well. The U.S. and Europe are not committed to the defense of Ukraine, but they do have obligations to help Ukrainians defend themselves, where that defense is viable. The Ukrainians never would have given up their nuclear weapons 20 years ago in response to the Budapest Memorandum negotiated by Moscow and Washington if they believed for an instant that the West would abandon them. This military aid should go through American special-operations forces and be in the nature of road bombs (IEDs), mortars, grenades, other explosives and effective small arms. U.S. training should be provided, if not in Ukraine itself, then in nearby countries. Ukraine can’t fight Russia army-to-army, but it can make Moscow think more than once if it faces the prospect of guerrilla war. If evidence is found that Ukrainians were using this assistance to fight in the eastern regions, then the aid should be stopped. Ukrainians have to understand (and presumably they do) that their military activity in the east would likely provoke a Russian invasion. This is the last thing Ukrainians or Americans want. Ukrainian government should find right leaders to take on the offensive in Eastern Ukraine and as soon as possible. People who carry weapons to intimidate and attack authorities must be disarmed with all means necessary as soon as possible. Government in Kiev should be more creative and reach to the professionals in its own military and special forces. Do not hesitate. The truth is with you and history will be on your side.